Lakeside School was built in 1967 in the now discredited "open style". These photographs detail some obvious problems that, along with others, are best remedied by renovation. 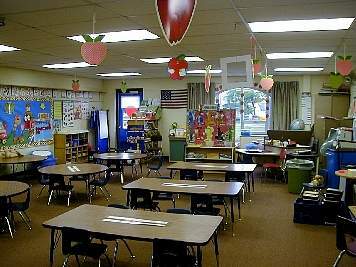 If the voters of Schoolcraft County want comprehensive and safe facilities to educate and train their children and grandchildren to meet the demands of a competitive future, then it is time to upgrade Schoolcraft County's public schools in the most cost effective manner. Given the community's history and forseeable future, it appears that middle school consolidation is the most appropriate option. 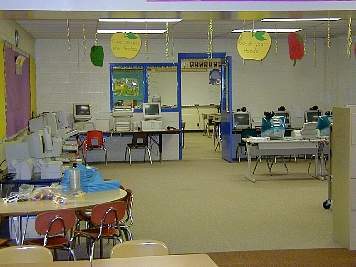 The Lakeside School was designed when the "open style" theory of education was considered to foster increased learning. 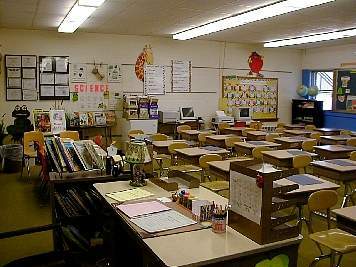 Note the interconnection of class rooms that spreads interruptions and disruptions to the occupants of all connected rooms. 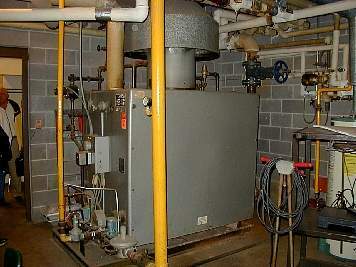 Aging heating system and non existent ventilation system. A "make do" computer lab with some ancient hardware, that bares little to no resemblance to a "professional" school lab. Is "all we can afford", out of the annual school budget, good enough? 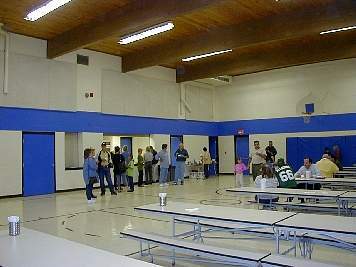 A non-regulation sized multipurpose gym facility with poor ventilation, and no permanent seating. It doubles as a cafeteria and? 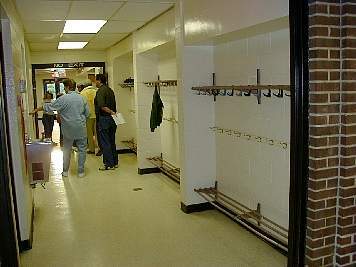 The restroom facilities are used as storage rooms. Recent legislation, concerning equal opportunity for girls and boys, has made a new community full sized gym desirable and almost a necessity to meet legislated and community demands. 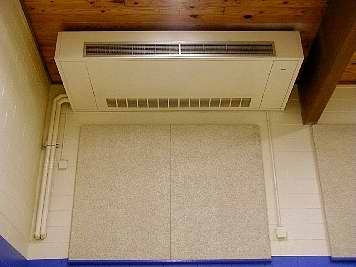 One of 2 heating and ventilation units in the "gym". By current standards, they heat well in the cool months and ventilate poorly in the warm months. 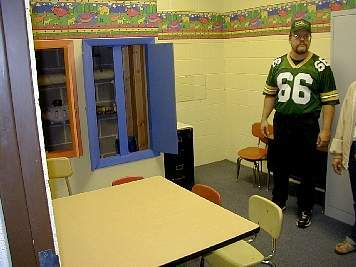 This is the utility room classroom, complete with switches and circuit breaker panels for much of the school's electrical service. Notice the stylish manner in which various pieces of control hardware have been disguised. A credit to frugality and innovation. Ventilation is poor for much of the year as, with windows and doors closed, the circulation of fresh air is limited to that provided by 26? year old unit ventilators in each classroom. Better than nothing, but it is doubtful that the circulation of fresh air is close to today's recommended standard. No lockers means no security and the increased chance of health problems from the close contact of children's clothes hung in the hallway. 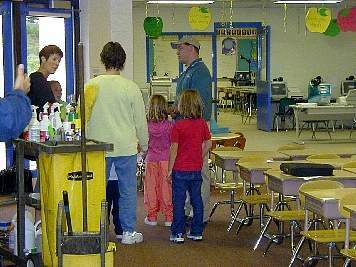 Security concerns are virtually absent from the school's design, with few appropriate ways to secure children or property. 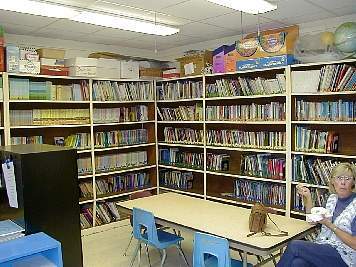 This Lakeside Middle School	library is cramped and lacks typical school library resources.